ExamDiff(TM) is a freeware Windows 95/98/Me/2000/XP/2003/Vista/7/2008 tool for visual file comparison. It is quick and very simple to use, and has a number of convenient features that many users have been asking for a long time from a file comparison tool. 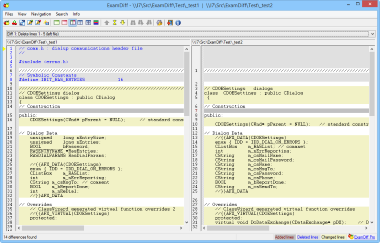 ExamDiff is a part of a suite of products that includes FtpVC(TM), an FTP-based Version Control System that allows joint software development remotely over the Internet. Compare directories and binary files. 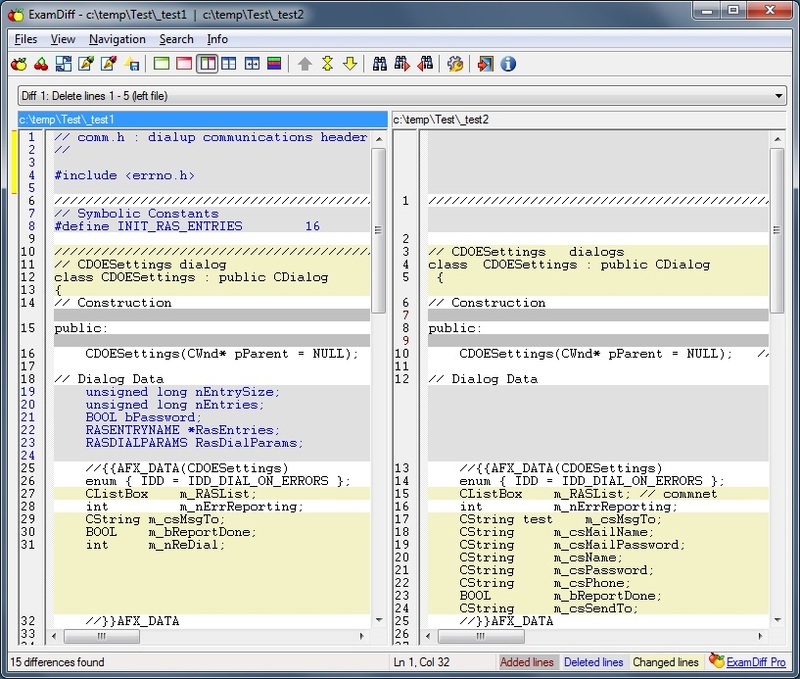 Perform three-way diff and merge. Edit files inside comparison panes. Highlight diffs down to the level of words or characters. Highlight syntax and ignore comments. Ignore lines and part of lines matching regular expressions. Print diff reports and create interactive HTML reports. Use plug-ins to compare documents, ZIP files, and more. There is no need to specify both filenames: just enter a directory name for one of the files to be compared. ExamDiff will try to use an entered filename with a specified directory name. Remembers a user-specified number of last compared first and second files. This allows quick selection of the two files the user wishes to compare. Autopick feature in Compare dialog that remembers matching file pairs. Automatically detects file changes and prompts the user to re-compare files. One push re-compare function which attempts to leave the viewer's focus in the same place as before the re-compare. Drag and drop support for dropping one or two files into the program's window (e.g. from Windows Explorer). Easy editing of the first and second files. ExamDiff will spawn any editor (configurable by the user) with the first or second file, and line number option (available for editors that support this, through ExamDiff variables: $FILE (first or second file name), $CURFIFF (number of line at which the current difference starts), and $CARET (number of line where the caret is located). Saves the file differences in a standard UNIX DIFF file. Allows the copying of text from the comparison panes via drag and drop, a hot key, or a right button pop up. Simple "Search" command to search for strings in the comparison panes. It also remembers a user specified number of most recent searches. Customizable text and background colors, font, tab size, and "Show Differences Only" option as well as options to "Ignore white spaces in lines", "Ignore changes in amount of white spaces in lines", "Ignore case", "Treat files as text files", "Ignore leading white space in lines" and "Ignore trailing white space in lines" for comparison. Fully customizable file extension filter. For example, the user can choose only .c and .cpp files or any other files he/she chooses to be displayed. Tooltips which include file properties (when the mouse cursor is placed over the pane title bars), difference number (when the cursor is over the yellow triangle marking the current difference), and etc. Adjustable pane splitter with smooth synchronized scrolling. Allows easy toggling between horizontal and vertical splitter orientation as well as splitter centering and panes hiding. Options /i, /w, /b, /l, /e, /t, or /d can be used with "! ", in which case the option will be negated (e.g. /!i means do not ignore case). Before submitting a bug report or a feature request, please consult the PrestoSoft Forums. If your question is not answered, submit bug reports, new feature requests, and comments using the PrestoSoft contact form. If you find ExamDiff useful, feel free to vote for it at CNet's Download.com.